Villa Angelina does not just share the big blue! It shares the above Psarou/Nammos benefit: as a guest you will be part of a different experience every night and day! Fireworks, glamorous boats, turquoise waters, fantastic parties are all part of the atmosphere of villa Angelina without obstructing its serene and peaceful setting, privacy and pure magic, yet in just 5 minutes by car you have access to one of the most cosmo-chic parts of the island or Mykonos Town or Scorpios. 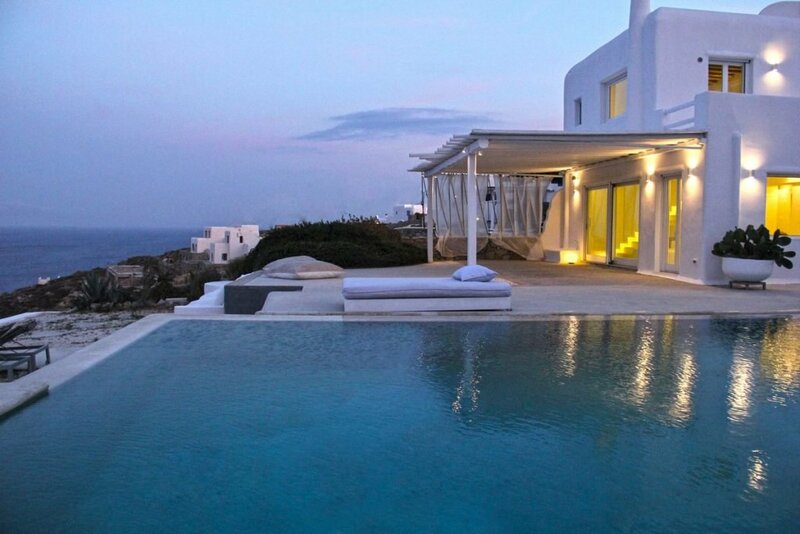 Sharing this gem location, this villa in in the heart of one of the most exclusive areas of the island with breathtaking views - the strictly residential and posh area of Agios Lazaros, above the cosmopolitan Psarou beach - in the southeast part of Mykonos Island. Built on a terraced hillside and consisting of the main villa, an independent guest studio and a garden guest house, Villa Angelina enjoys a splendid view of 4 more other beach beauties Platis Gialos Bay, Agia Anna, Paraga and Paradise, the Aegean Sea and Islands in the distance. Upon entry to this Mykonos villas one finds the independent guest house composed of an en-suite bedroom with a double bed and a walk-in closet and a cozy living room that exits to the pool terrace. The guest house houses 2-4 adults. Villa Angelina proximity to the vibrant town of Mykonos, Psarou and Nammos beach bar-restaurant, Platys Gialos with its shopping facilities and small, busy port, as well as, to the more traditional Ornos – render into a great destination. Ideal for two or three families and/or friends who wish to share unique vacation experiences surrounded by an elegant and serene environment with the most breathtaking views to the Aegean. Upper level: Master bedroom en-suite and 2 more en suite bedrooms. Guest Studio: Bedroom en-suite with a double bed and 2 built-in sofa beds.